I took the time today to do something I haven't done in a long time- browse through a few of the latest posts form the Elementary Ed folder on my Google Reader. You don't think it's really been that long? Oh trust me, I have evidence! 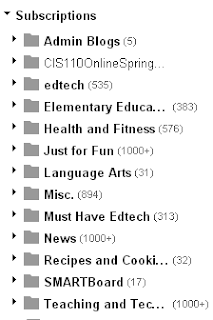 Those numbers (which indicate the number of unread items in each folder) aren't pretty are they? While these numbers are true, they don't tell you that I've still kept up with Twitter through Hootsuite and Flipboard, and have done a little blog browsing on Flipboard, but obviously I've fallen way behind in the last few weeks. And yes, this is a crazy busy time of year, not just at work but also personally. But is that an excuse to fall behind or just stop reading the feeds I've subscribed to? While we all need a break sometimes, I don't think it would be okay at all for me to just stop reading what other teachers and educators are doing, seeing their ideas, and keeping up with the latest issues and never pick back up with it. Within 10 minutes of looking through a couple posts in my Elementary Education folder, I had found several pretty awesome lesson ideas and teaching reflections. Here's the thing- as an educator, I've pretty much signed up and agreed to be a life-long learner, right? Furthermore, in my current position, I also provide lesson ideas and have the responsibility of training other teachers. If I don't keep up with what is going on in classrooms both in my county and globally, am I not doing a disservice to the teachers I serve? I think so. And by keeping up- I don't mean by just knowing what vendors or other people in my position are doing. Neither of those are necessarily bad resources, but if I'm going to truly help teachers, isn't it going to help me to get first-hand reports and ideas from people who are doing great things in the classroom right now? I think so!